Satisfy your taste buds with great tasting Velveeta Cheesy Skillets. Made with rich and creamy Velveeta cheese sauce--it's liquid gold! 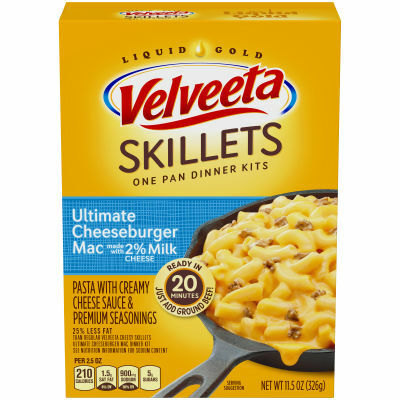 25% less fat than regular Velveeta Cheesy Skillets Ultimate Cheeseburger Mac dinner kit. Fat has been reduced from 9g to 3.5g per serving.